Using Christmas flameless LED candles is an easy way to add some ambient charm to your home without going through the troubles and risks associated with using real candles. I do not own any of these candles but I have seen some recently and think they are quite lovely. My mother would have loved to receive some of these as gifts so that she could place them around the house. She probably would have had them on around the clock until Santa Claus came a knocking. Unlike the candles with timers, these do require that you turn them off and on. This is fine if you don’t have a set plan for when you want their soft glowing throughout the room. Worst case scenario, you leave them on full time and need to change the batteries sooner than later. Either way, they both accomplish the same thing and come with wonderful sculptures and images. I looked for any that basically made me say “OH that looks neat!” As you can see my criteria was extremely strict (just kidding). Turns out it doesn’t take much to please me but I hope that you find at least one of them to your liking. Even if you are not a candle person, I am sure that you can think of a friend or family member who would appreciate having one of these flameless LED candles as a gift. Anyone who has looked at a few of my posts will have picked up on the fact that I have a severe soft spot in my heart for snowmen. So it may come as a surprise when I tell you that my favorite candles are between the two Santa Claus ones. Hence why I included them both! The first one is actually a mix between a snow globe and a candle. I noticed it when doing some research on musical snow globes and thought it was a neat idea. I don’t really know if it is a great idea to shake a candle snow globe but it is an option and provides a Santa Claus and reindeer scene. 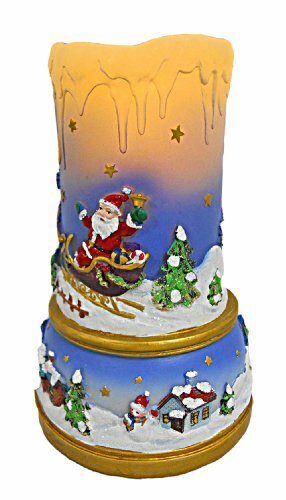 **This lovely candle that I found in 2014 is currently not available but I have updated it to a similar one that has a lovely snowman scene! 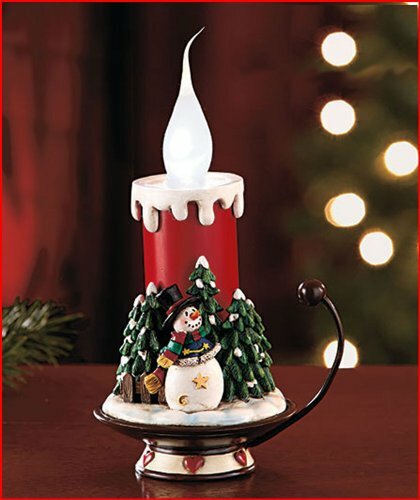 The second Santa Claus one is a lovely candle with a flying Santa around the outside. It would look great whether it was on or off and I would probably have no qualms about leaving a candle like this out on a table throughout the year. I love that the picture envelops the entire candle including the base so it tells a story no matter which side you are looking at. The other two have more of an old fashion feel to them. Well snowmen aren’t that old fashioned but it does have an antique-like candle holder on the bottom to help give off that vintage feel. Please be aware that this is a somewhat smaller candle so if you want something larger I would look at other options. And for anyone looking for a plain flameless LED window candle, the pewter candle has a realistic flickering flame and will be perfect for a window, balcony, or table.